The next person on our list of stories to tell is Holden Jannusch. I was sitting with Abby Sunu, a student worker on the CSA marketing team, asking her how she would describe our fellow co-worker Holden. Wise, thoughtful, and unique were just a few words that came to mind, but he is much more than just that. Holden is a very passionate and kind individual. He is unique too! He transferred to APU for his senior year of college. Now why would anyone do that you may ask? Let me tell you more about his story, his passions, and the wonderful ministry he is coordinating through the Center for Student Action. “My name is Holden Jannusch. I am 22 years old and I am from Naperville, Illinois. I am a biblical studies major, but I actually was a math major until my junior year. I wanted to be a high school math teacher. I have always had a heart for youth and so I thought being a teacher would be an outlet to get my students to go to Young Life. I realized that what I really desired was for students to come to know Jesus, and so I decided to switch to biblical studies and pursue outright ministry. Holden is a huge coffee nerd. When I asked about his passions the first thing that he discussed was the beauty of coffee. “Some people would consider me a coffee snob, but I’m also addicted to caffeine, so I can’t always afford to be picky. I just love black coffee. I try to make a pour over every morning. There is a real beauty in the art of making a perfect cup of coffee.” Holden is also passionate about working out, and playing basketball. A typical weekend for him consists of studying, having alone time, hanging out with friends, and date nights, of course. This lead me into asking holden more specific questions about his job and the ministry that he runs. Holden started to explain his role in the CSA. “I run a sports ministry. I have played sports my entire life, and some of my fondest memories are of playing football and lacrosse. I love being active, so it is has been a blessing to see kids play soccer in a league that their families can afford. The ministry provides an opportunity for kids in the local azusa community to participate in sports without having to worry about the financials. The coaches and referees are all volunteers from APU.” When I was listening to Holden, I realized how much of an impact ministry can have without any bells and whistles. As Christians, we have this idea of ministry where we have to put ourselves in an unfamiliar place, such as serving overseas, but ministry is really about loving your neighbor in whatever way you can. The best quality about this ministry is that it does not have to be a one time thing. Students can participate as many times as they want, building relationships with the kids, and the local Azusa community. Holden doesn’t really know what is next for him after graduation. He knows in his heart that as long as he seeks Jesus, God will set his path straight. For right now, Holden will have the opportunity to be leading students to Hong Kong this summer on an Action Team. He is excited for the process to begin in the spring and cannot wait to see what else God has in store for him. If you don't know Holden, I hope this helps paint a better picture of his character. Under all of his sarcasm, he is wise, humble, and kind. Get to know Holden! Maybe he will even teach you how to make a great cup of coffee. I had the privilege to sit down with Angelique Low on a beautiful sunny Thursday afternoon. 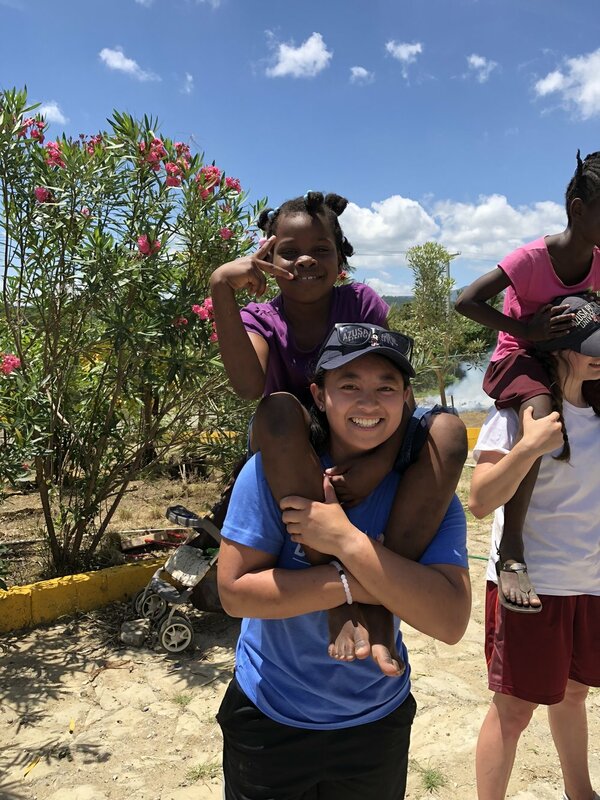 With patience, gratitude, and passion, she began to tell me her story: Who she is, how she got to going on an Action Team, and her experience in the Dominican Republic (DR). People know Angelique by the nickname “AJ”. She is from Pleasanton, California, and going to be a graduating senior in May with a degree in Physical Education. On her own time she loves to exercise, eat pasta, and is a coach for girls basketball and volleyball teams in Covina. AJ brought this confidence to the table as we talked about her experience in the DR. I was curious about how she got connected to Action Teams in the first place, so I asked her how she got connected to being part of such an amazing experience. She told me she heard about Action Teams in chapel as a Freshman, but did not pursue the interest the first time. Her Sophomore year she heard the announcement during chapel again and knew there was a distinct tugging on her heart to find out more information. So she did, and summer after Sophomore year she went on her first Action Team to Moldova. The following year (this past summer), she went to the DR.
Of course with every experience there are aspects that keep us from saying yes. Challenges and fears are just a couple but AJ did not realize God put these aspects in front of her for a reason. She was challenged by living out the motto her youth pastor taught her, “Being vulnerable makes you authentic.” I asked her how she lived by this, and she explained to me how she was the first to set an example for her team by being vulnerable and sharing her testimony. Fear of having a spiritual high from missions and settling back to typical routine. AJ’s life before going to the DR was rushed, busy, and always on a fixed timely schedule. Finishing finals, moving out of her apartment, and getting ready to leave to the DR all within three days made it even more hectic, but would she change a thing about that? No. It was humbling to see how open she was with me just within talking to her for an hour. She opened up to me saying how she was struggling by feeling disconnected with God, lacking confidence, and not feeling valued by her peers. However, her leaders helped her by walking alongside her and affirming her of her self-worth. God reminded her of His unfailing love through the encouragement, love, and support of her leaders and members before and during the Action Team. Life after the DR still held its challenges. AJ expressed how she would catch herself being a hypocrite sometimes, especially with intentionality. One of the most important things she learned was intentionality and relationships with others. At APU we get caught up in the community and think we are being intentional with each other but are we really? Moving forward AJ is making it a goal to be intentional with her friends and going past the surface level. Whether that means praying for someone in person rather than saying I’ll pray for you later. Or even having a 1 on 1 coffee hangout to catch up with friends. To her it does not mean knowing everyone's life story but having more intentional conversations. AJ explains her trip as a continual growing process. Her faith is still growing, and she does not hear God speak to her everyday, but she knows He’s working in her life through the people she encounters, and ways she cannot see right away. She is grateful for this experience because it has reminded her of her privileges of living in the U.S, how to limit materialism, and letting God into all aspects of life. Moving forward AJ continues to strive for servant leadership, authenticity, selflessness, and experiencing new cultures. 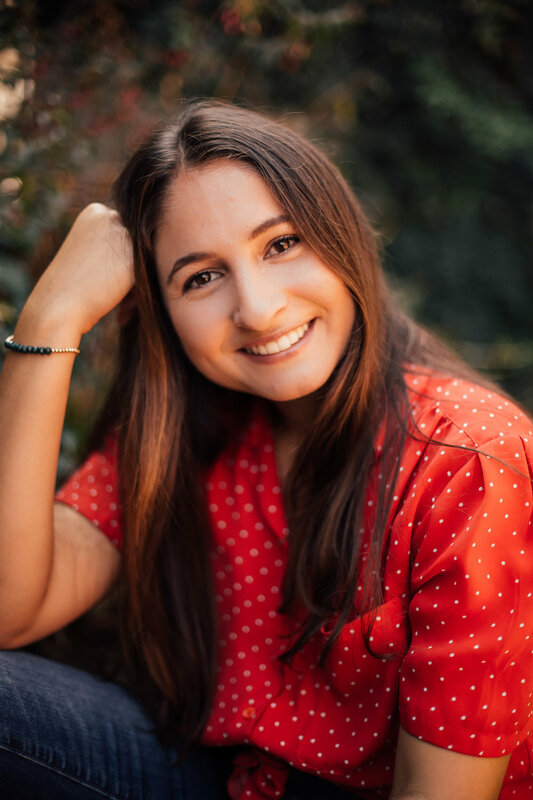 She is currently a coach for 7th grade girls basketball and volleyball teams in Covina, is a senior class mentor through the discipleship office, and is going to be leading an Action Team to Guatemala this upcoming summer. She continues to live life with a grateful heart and approachable smile that gives people warmth and welcome. She is willing to share more about her experience with Action Teams and get to know anyone in her community. I love storytelling. I love storytelling specifically because it can depict someone's personality just the way they tell it. Each person can tell it differently either theatrical, comical, philosophical, reserved, or in extreme detail. Everyone has a story so let me start off by telling you mine. The Storyteller: Who am I? My name is Rosanna Sainez, I am 21 years old, from San Francisco, California. I am a senior at APU studying Psychology. Other than serving, I am very passionate about holistic living and how food is thy medicine. Some of my favorite things include whipping up new healthy recipes, running, plants, museums, the beach, and investing in friendships. When I was little my mom read to me a children's storybook called, “Love You Forever.” In case you are not familiar, it is about a mother's unending love and care for her son as he grows up. However when the mother gets old and is unable to care for herself, the roles reverse and the son cares for his mom. So why is a children's storybook so significant to this topic? It is because it gives meaning. In one way or another a story gives meaning. It can reflect on a person's experience, relate with an existing experience, or inspire a person in what they want to experience. As being a part of the Center for Student Action (CSA) we believe in sharing stories. I currently work in the CSA as a marketing intern where I have the privilege to not only listen but write about people's stories. Even as a student leader there are still many doubts, fears and setbacks. Spring of 2017, I was doubtful in going on a Mexico Outreach trip. I was sitting with my discipleship group leader at the time outside of Cougar Walk and I remember contemplating whether I should go on the trip or be with my family. She simply just told me to risk it, “What's the harm in going! is there going to be a negative outcome?” The answer was no. What fills the brain with doubt is being uncomfortable with the unknown. Well guess what, I decided to go to Mexico, on the Women's Prison team and that's when my heart first cracked. I imagine it like this. Each time I get involved with service I am reminded how much I love knowing people's stories. My heart breaks but mends back together with each new experience, which opens up my eyes to what God sees. This trip opened the door to my passion for serving, which lead me to future CSA opportunities. Summer of 2018, I decided to apply to an Action Team where I got placed on a team to Senegal, Africa. Would you believe after a year of leadership in the CSA office that I went through the same pattern of doubt and fear. Yup, I did. However, I had to remind myself of God's provision through those past experiences which helped me trust him more with this new opportunity. I would love to explain my whole trip in detail, but then this blog would be ten pages long. However, if I were to describe to you what I learned through my experience, I would tell you that God showed me what it means to be valued, through the people of Senegal and his own earthly creation. When it comes to trips overseas, or mission trips in general people typically think they have to be “called” by God, or that “the call” is for the experienced. Wrong! I was sitting with my coworker Jack Struiksma on a Friday afternoon and I asked him if there was a significant moment where he felt “called” to lead an action team. With words of wisdom he simply just said, “It wasn't a matter of calling for me, it was just a matter of God capturing my heart and through that he developed my passion to serve His kingdom.” Wow, you could not have said it any better Jack. In my experience I was exposed to ministry before I knew God was leading me to serve. Each experience is a risk, but it is just another opportunity to create another story. Think about it as developing your own storybook. When you look back at your life, what would you have wanted it to be filled with? The reason why I tell my story is because I believe that even leaders are broken, have doubts, and are still fearful when it comes to getting involved in ministry. Those human instincts will not always go away in life, but it is opportunities like these that let you trust in God, and stretch you away from the uncomfortable. Ask any one of us in the CSA, we will tell you the truth. Stay tuned to hear more transforming stories that happen through our office.